Ladies and Gentlemen…meet Bevy Smith. She’s a self-described gal about town that lives in NYC. She is a self-made woman, who left her day job a few years ago to live her life the way she wanted…and she’s doing it. She’s a former fashion editor that has turned into an inspirational speaker, brand ambassador, television host, and businesswoman. I had the pleasure of meeting her a few years ago via a mutual friend at a conference, and the minute we met, I knew we would be pals. It’s always fun to meet successful women that you can learn from…and have fun with. One of Bevy’s businesses, is Dinner with Bevy. She hosts intimate dinner parties, sometimes for brands and sometimes for celebrities. Recently, she started doing public events, Dining with Bevy, Life with Vision. 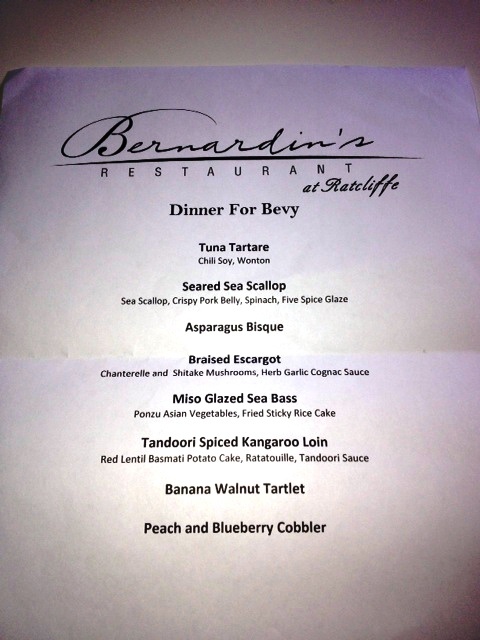 This past weekend, she held an event in Charlotte…and I was lucky enough to have my own Dinner with Bevy. 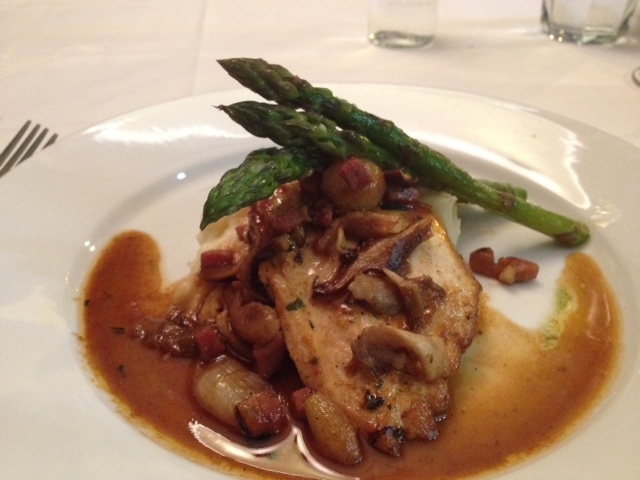 We dined at Bernardin. Not to be confused with Le Bernardin in New York City, which is owned by Eric Ripert, although the Chef trained there. Bernardin, is located in the old Ratcliffe building and was once a flower shop. The original structure was incorporated into the high-rise condo building built on top/around it. It’s a great space…and the one Bevy chose for her event, so we did a tasting menu. I didn’t take photos of all the courses…and we changed a few things as well but here are some of the dishes from our very entertaining evening. 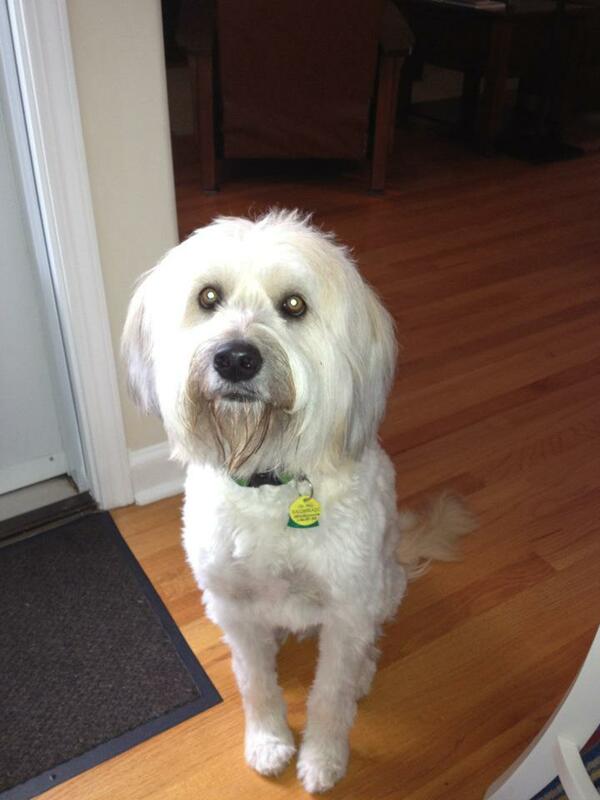 Also joining us was her friend/colleague CJ, who I now adore, even though he “eats nothing” as Bevy stated. Here is the menu…which we adjusted slightly. 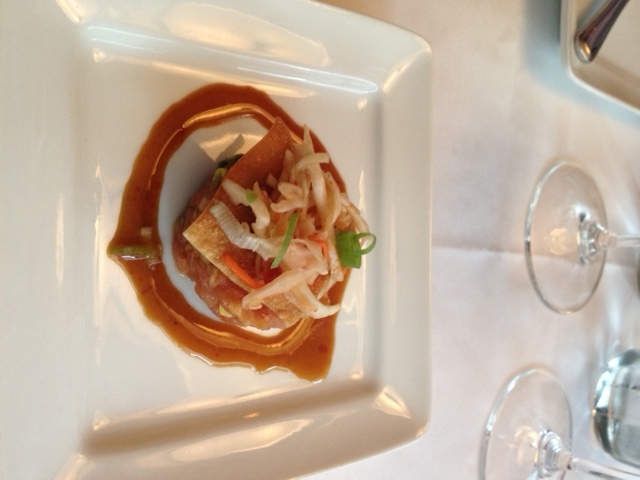 First up was the Tuna Tartar. A bit spicy but certainly fresh and delicious. After this they served a seared scallop over a piece of pork belly that was so delicious I forgot to take a photo. Next up was the asparagus bisque. I had something similar there for lunch a few months ago. I think it was a cold asparagus gazpacho. 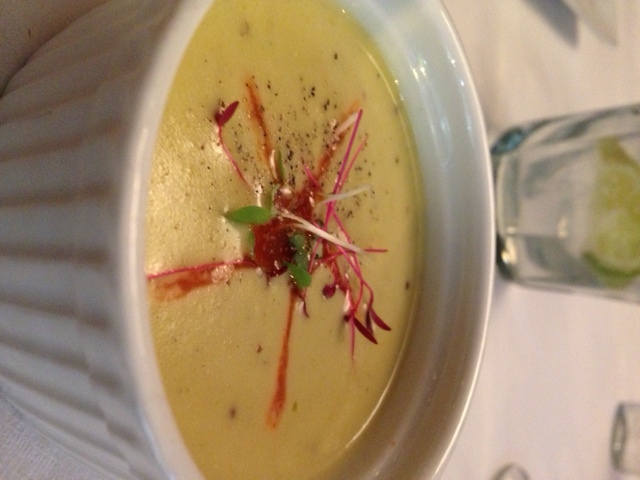 This bisque was divine. The escargot was next…which is just something I do not eat. The list of things I don’t eat is fairly small, but snails…not so much. 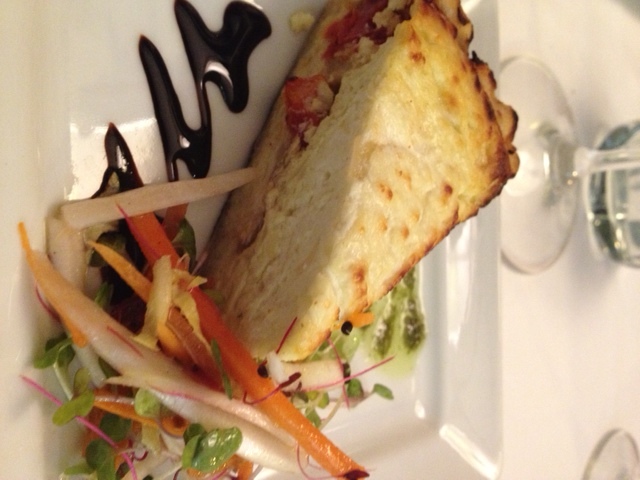 The staff was lovely and substituted this amazing goat cheese tart and duck spring rolls for CJ. He claims he tried the duck…but Bevy and I ended up eating them. The sea bass was also delicious and it was then that I realized that we still had another course and that I was going to be so full. I’m glad I paced myself for this cheese stuffed chicken. We did this instead of the Kangaroo, because that might also be on my list of things I am not interested in eating. Both desserts were also amazing although my preference was the banana walnut tart…and I could only eat a few bites. Stuffed! It was one of my favorite dinners this year not only for the food but the wonderful company. We laughed a lot at this table. Follow Ms. Bevy on twitter. @bevysmith She is full of wisdom and humor. Still coming up is the pesto…I just forgot to upload the photos and well I’m dog sitting this weekend at my parents. This is the lucky recipient of my cooking tonight. Meet Jamie Davis. Realizing that I have been lazy about my blog this summer…I decided to pay tribute to Julia Child’s 100th birthday today. I have always admired Julia. I used to watch her show on KQED in San Francisco. I’ve eaten at the now closed, Julia’s Kitchen in Napa, which was a tribute to her at an amazing garden/museum called Copia. 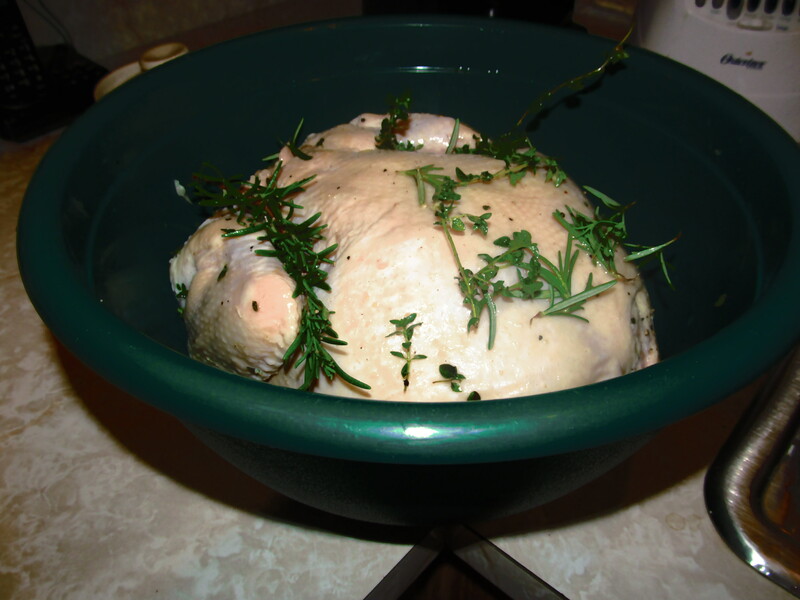 So I decided to roast a chicken from one of her recipes…with garlic, lemon, rosemary and thyme. My parents had so nicely given me thyme and rosemary from the garden and had shared a ton of lemons they had gotten at the market but couldn’t use. While searching for Julia recipes I stumbled upon a potato recipe from Judith Jones, who used to work with Julia on recipes. I decided to make it not only because it looked yummy but because I dug the story. Just sounds like Julia Child doesn’t it? LOVE her. 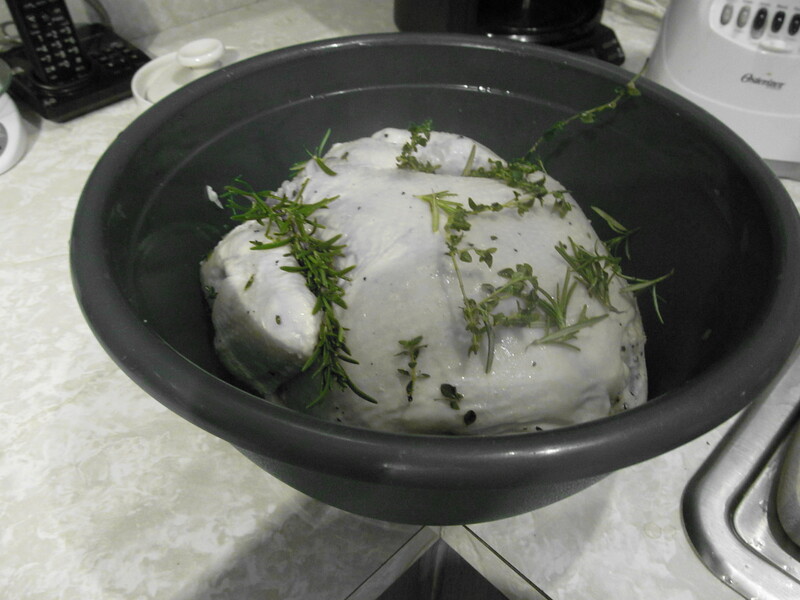 I bathed the chicken the juice of 2 lemons, rosemary, thyme, salt and pepper. Since I had a massage that afternoon, prior to my friend Kelly coming over for dinner, I covered it in the bowl and put it in the fridge. But first I took some photos! Yup starting to fool around with my camera a bit more! Watch out people! Ok so as Julia directed, I preheated the oven to 400…got out my roasting pan, stuffed the chicken with the lemons, garlic, and herbs and cut up an onion and put my chicken in. 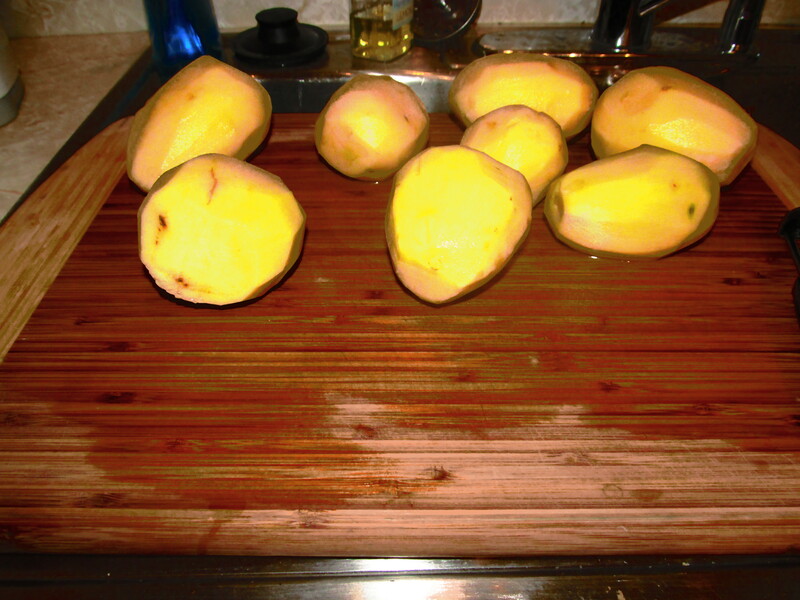 Drizzled some Olive Oil on it…set the time for 1 hr and 15 minutes and started on my potatoes. 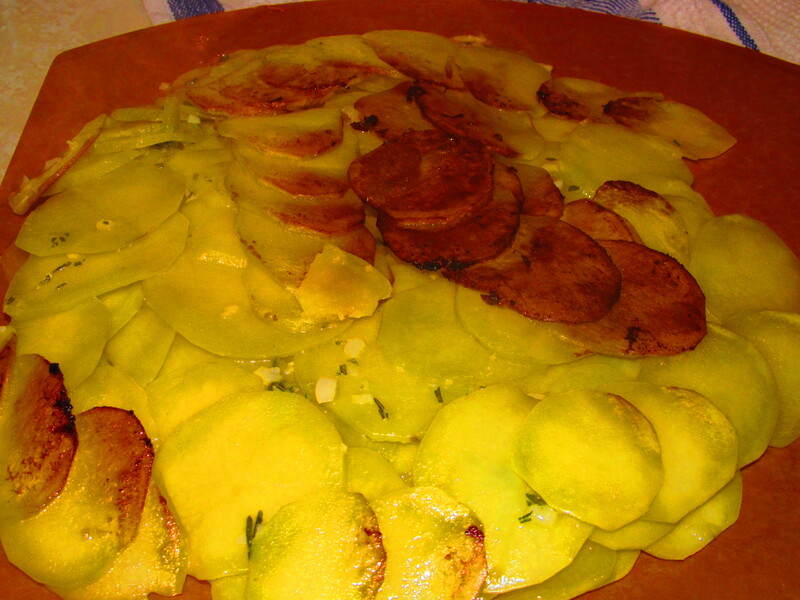 Here is the recipe for the potatoes. I had to adapt it a bit to make it bigger. I also had a new mandolin so I was pumped to use it! 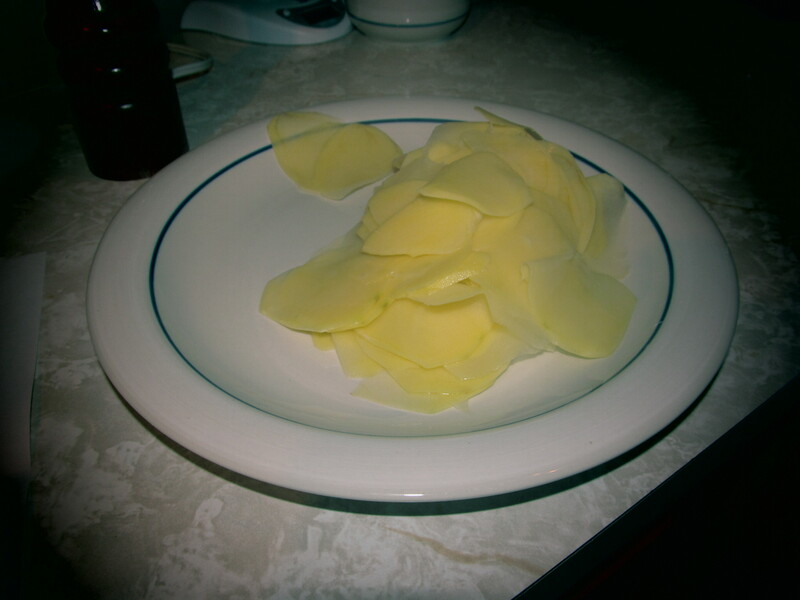 First, I peeled all of the potatoes. 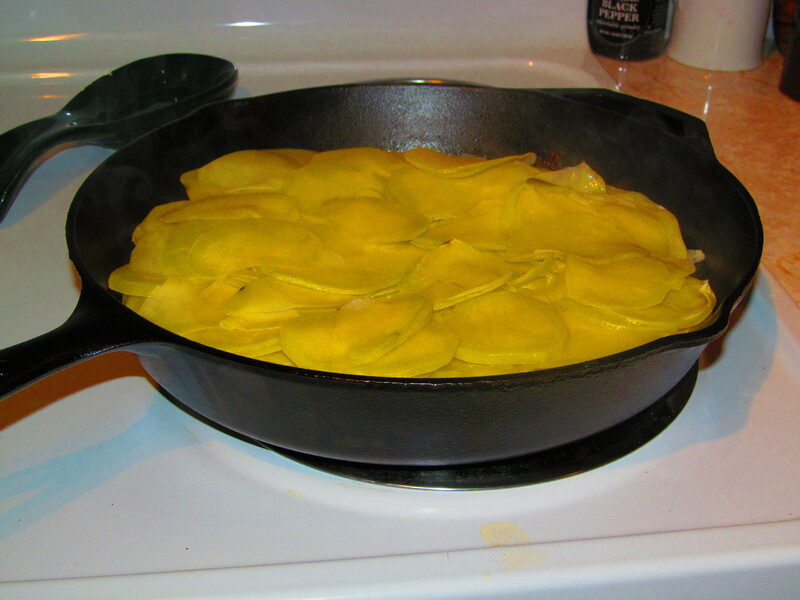 I used yukon golds. 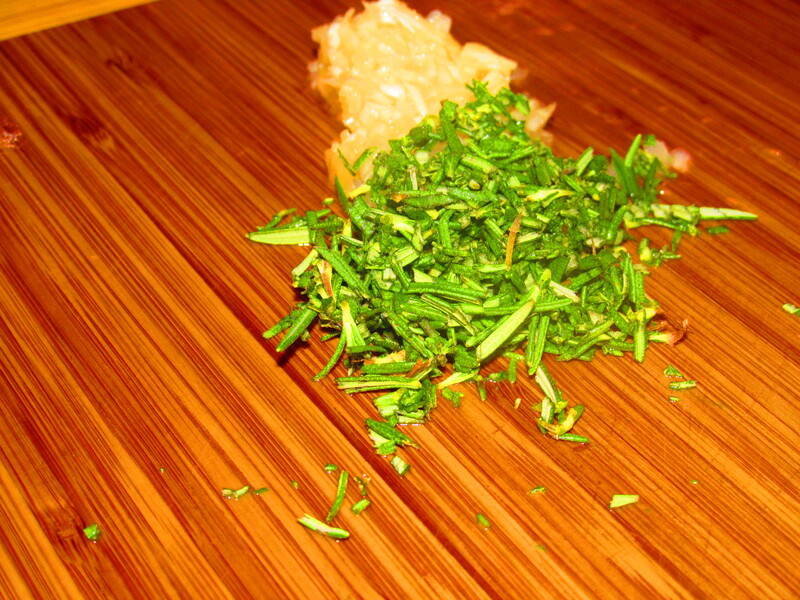 I also diced and smashed garlic and chopped some rosemary and after I took this arty photo I combined them with butter. I love butter. I put some regular butter in the pan and then layered the potatoes in it…each layer adding some of the garlic rosemary butter. I let them cook on medium for about 15 minutes and I thought there would be a pretty good crust on the bottom. Kelly and I devised a strategy to flip them out of the pan (as the recipe called for) and not get it all over the kitchen. 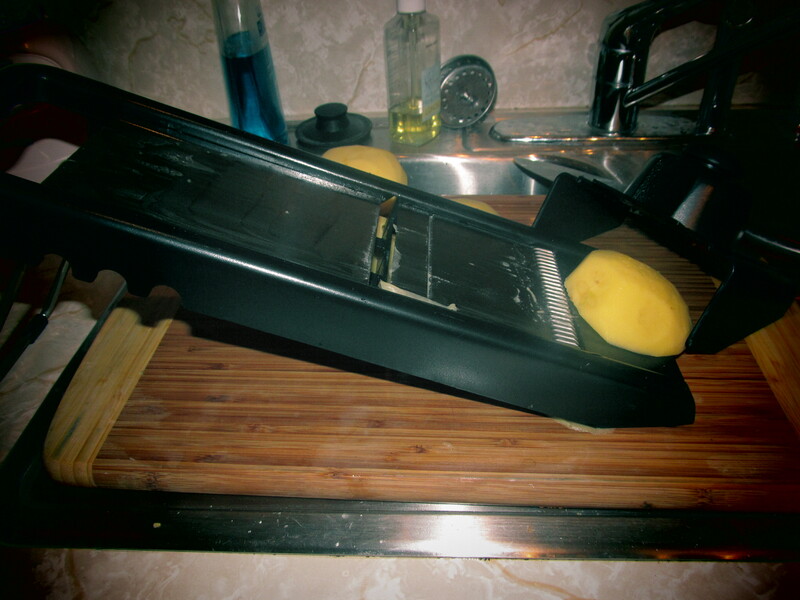 This was the result of that…hahaha good times in the kitchen. So we slid it back in and let it cook for about 15 more minutes, after more butter on the bottom of course, and then once the chicken was out we put it on broil to get this side crusty. 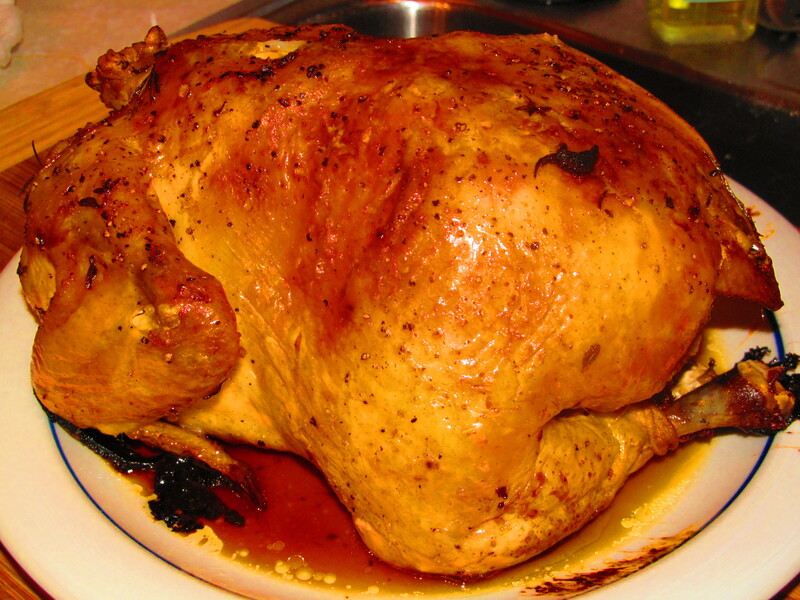 So…how about I roasted my chicken upside down? Here is the good thing about that…which I learned from my Dad when we smoke the Thanksgiving turkey. 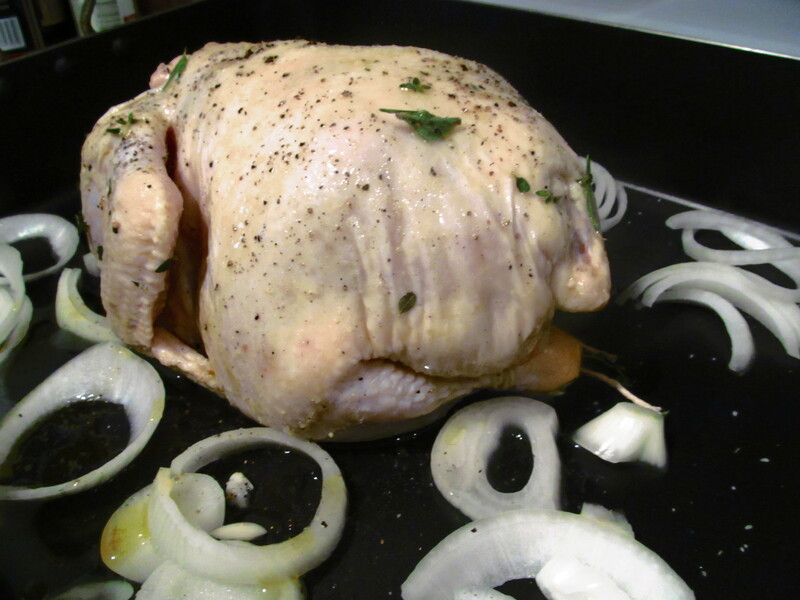 When the breasts are on the bottom…all the juices run into them and it makes the chicken really juicy and not dry. This was not my intent…it was just a mistake but the breasts were indeed very juicy. Hey…I keep telling you people I’m not perfect! Another example of that…is the sauce. Julia said to use the bits in the pan, the onions, etc and make a sauce. 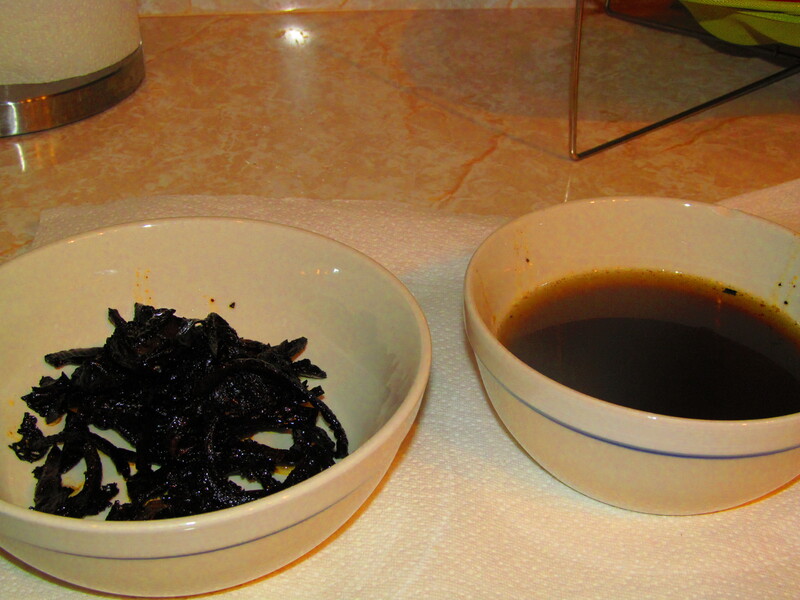 Well my onions were burnt…and this is what the sauce looked like…so obviously we did not eat it. We stuck our fingers in it, because sometimes stuff that doesn’t look good still tastes good, but it was gross. 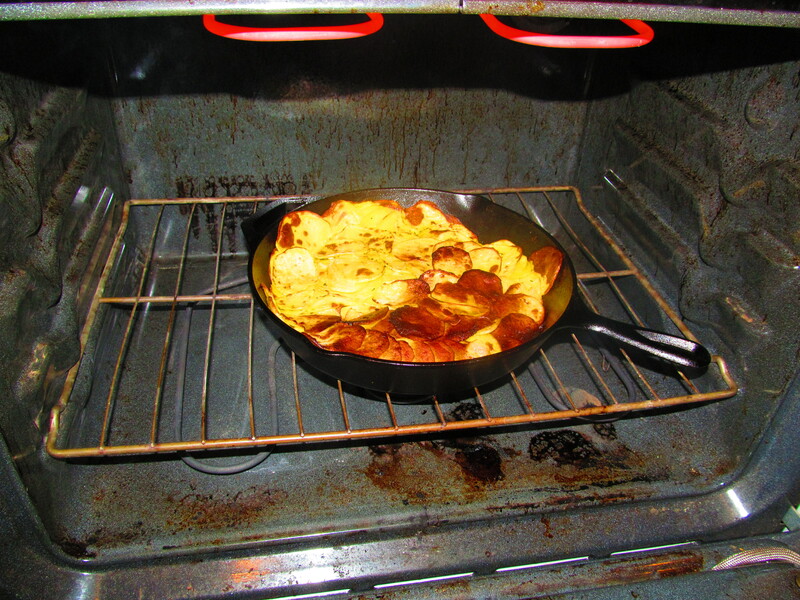 Proof that sometimes, even when you follow a recipe…sometimes it was just not meant to be. The onions are on the left…sauce on the right. All in all it was great catching up w/ my friend Kelly. Both dishes weren’t quite as I wanted them but both were tasty! Happy Birthday Julia Child! 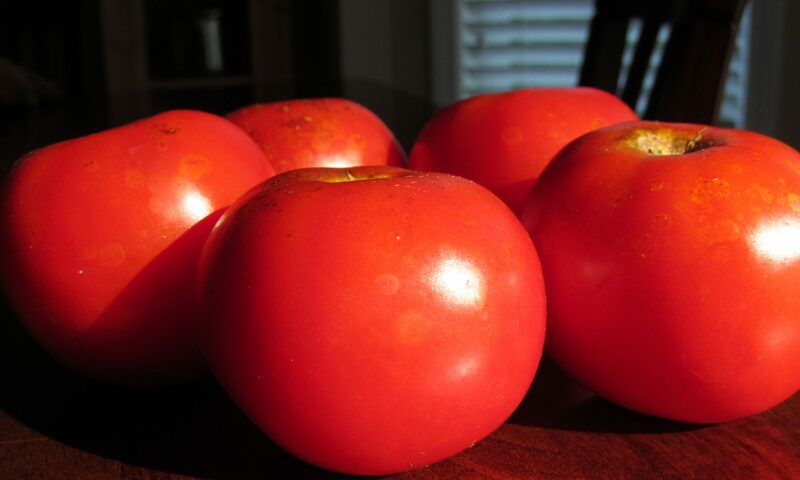 Pesto: If you’ve never made it…you will soon as it’s SO easy! Pasta Fagioli: An easy, weeknight soup I stole from Rachel Ray and made my own!